One of the best-known livery collars is the Collar of Esses, which has been in continuous use in the United Kingdom since the 15th century. Various forms of livery were used in the Middle Ages to denote attachment to a great person by friends, servants, and political supporters. The collar, usually of precious metal, was the grandest form of these, usually given by the person the livery denoted to his closest or most important associates, but should not, in the early period, be seen as separate from the wider phenomenon of livery badges, clothes and other forms. From the collar hung a badge or device indicating the person the livery related to; the most important part of the ensemble for contemporaries. Equally gold collars that had no livery connotations were worn. Livery collars seem to be first recorded in the 14th century. Charles V of France in 1378 granted to his Chamberlain Geoffrey de Belleville the right of bearing in all feasts and in all companies the collar of the Cosse de Geneste or Broomcod, a collar which was accepted and worn even by the English kings, Charles VI sending such collars to Richard II and to his three uncles. This French type of collar, a chain of couples of broomcods linked by jewels, is seen in the contemporary Wilton Diptych portrait of Richard II, with Richard's own device of the white hart hanging below (the angels accompanying the Virgin also wear Richard's livery badges). The same collar was worn by Henry IV on the way to his crowning. During the sitting of the Parliament of England in 1394 the complaints of Richard FitzAlan, 11th Earl of Arundel against Richard II are recorded, one of his grievances being that the king had been wearing the livery collar of his uncle John of Gaunt, Duke of Lancaster, and that people of the king's following wore the same livery. To which the king answered that soon after the return from Spain (in 1389) of his uncle, the duke, he himself took the collar from his uncle's neck, putting it on his own, which collar the king would wear and use for a sign of the good and whole-hearted love between them, even as he wore the liveries of his other uncles. Livery collars of the king of France, of Queen Anne and of the dukes of York and Lancaster are recorded amongst the royal plate and jewels which in the first year of Henry IV had come to the king's hands. The inventory shows that Queen Anne's collar, was made up of sprigs of rosemary garnished with pearls. The York collar had falcons and fetterlocks, and the Lancaster collar was doubtless that Collar of Esses (or S S) used by the duke's son, Henry of Bolingbroke (Henry IV), as an earl, duke and king. This famous livery collar, which has never passed out of use, takes many forms, its Esses being sometimes linked together chainwise, and sometimes, in early examples, as the ornamental bosses of a garter-shaped strap-collar. The oldest effigy bearing it is that in Spratton church of Sir John Swinford, who died in 1371. Swinford was a follower of John of Gaunt, and the date of his death easily disposes of the theory that the Esses were devised by Henry IV to stand for his motto or "word" of Soverayne. Many explanations are given of the origin of these letters, but none has as yet been established. During the reigns of Henry IV, his son (Henry V), and grandson (Henry VI), the collar of Esses was a royal badge of the Lancastrian house and party, the white swan usually being its pendant. In one of Henry VI's own collars the S was joined to the Broomcod of the French device, thus symbolizing the king's claim to the two kingdoms. The kings of the house of York and their chief followers wore the Yorkist collar of suns and roses, with the white lion of March, the Clare bull, or Richard's white boar for a pendant device. Henry VIII brought back the collar of Esses, a portcullis or a Tudor rose hanging from it, although in a portrait of him, in the Society of Antiquaries, he wears the rose "en soleil" alternating with knots, and his son (later Edward VI, when young, had a collar of red and white roses. Besides these royal collars, the 14th and 15th centuries show many private devices. A monumental brass at Mildenhall shows a knight whose badge of a dog or wolf circled by a crown hangs from a collar with edges suggesting a pruned bough or the ragged staff. Thomas of Markenfield (d. c. 1415) on his brass at Ripon has a strange collar of park palings with a badge of a hart in a park, and the Lord Berkeley (d. 1392) wears one set with mermaids. In the Renaissance, gold chains tended to replace collars, and portrait miniature of the donor tended to replace the earlier badges with symbolic devices, although "picture boxes" containing miniatures could be highly extravagant pieces of jewellery. The Elizabethan artist Nicholas Hilliard was both a goldsmith and miniaturist, and so produced the whole of pieces like the Armada Jewel, given by Queen Elizabeth I of England to a courtier. When the Earl of Rutland returned from an embassy to Denmark, sixteen members of his party were given chains of gold with the James I of England's picture, and others received just a picture. During the sixteenth century collars became marks of a specific office or Order, and subsequently remained so. 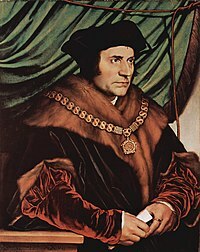 Most English mayors (which is a mainly a ceremonial office in most places) wear a collar of office, and new ones are still designed for new municipalities. The mayor's spouse may have a much smaller version. These are worn over normal clothes when on official duties. Following English practice, most Canadian mayors also wear chains of office. Collars of various devices are worn by the knights of some of the European orders of knighthood. The custom was begun by Philip III, Duke of Burgundy, who gave his knights of the Golden Fleece, badges of a golden fleece hung from a collar of flints, steels and sparks. Following this new fashion, Louis XI of France, when instituting his order of St. Michael in 1469, gave the knights collars of scallop shells linked on a chain. The chain was doubled by Charles VIII, and the pattern suffered other changes before the order lapsed in 1830. At the end of the 18th century most of the European orders had only one rank—that of Knight—and although they usually had collars the cross or badge was now worn on a ribbon around the neck or over the right shoulder. When the orders got more democratic several ranks were introduced and only the highest grade, the Grand Commanders or Grand Crosses, wore collars. The Netherlands never had collars but several Belgian, most of the Austrian and Prussian orders and several Portuguese orders had collars. In Portugal all the members of these orders of knighthood wear a collar but the collars of the Grand-crosses are more elaborate. Sometimes the collar is the insignia of office of the Grand Master of the order. The French president therefore wears the collar of the Order of the Legion of Honour. In other countries such as Brazil the collar is a rank above that of a Grand Cross and it is reserved for the president and foreign heads of state. Napoleon I introduced "the Grand aigle", a collar as the highest rank in his Legion of Honour. It did not survive his downfall. Until the reign of Henry VIII, the Order of the Garter, most ancient of the great knightly orders, had no collar. But the Tudor king must needs match in all things with continental sovereigns, and the present collar of the Garter knights, with its golden knots and its buckled garters enclosing white roses set on red roses, has its origin in the Tudor age. Most of the British orders of knighthood have collars and they are still worn on special occasions.The Distinguished Service Order, the Order of Merit, The Order of the Companions of Honour and the Imperial Service Order are the exceptions. The Royal Victorian Chain is a collar and there are no other insignia. Collars also have a long history within Freemasonry. Collars are often worn by officers of high rank. Nearly all grand lodge officers wear collars as an emblem of their office. Many times these collars are quite valuable, featuring gold and precious jewels.